I got my first pair of white jeans just last year. I haven't even owned them for a year. I had been interested in owning a pair of white jeans for a long time, but struggled to find a pair that fit well and didn't have see through pockets. I was thrilled to find these at Old Navy last year, since they looked great and were really affordable! I figured even if I only wore them a few times they were worth the cost. Fortunately, I ended up wearing them quite a lot last year, but all in the warmer months when white is very popular! 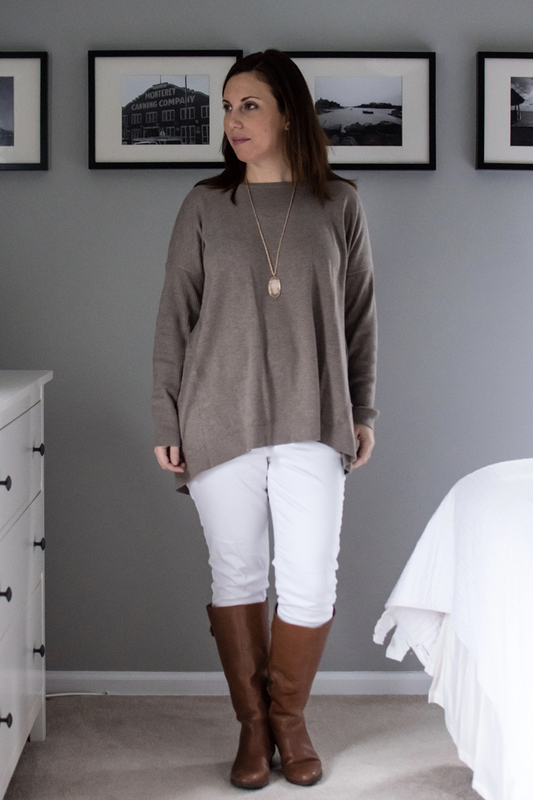 And while white jeans are becoming more acceptable to wear all year round, I'm still hesitant about wearing them out in public in the winter. There's just something about them that scream warmer weather to me. But the more I peruse fashion blogs and Pinterest, I'm seeing that "winter white" really is a thing. So here I am today, giving white jeans in the winter a try. I'll be honest that I have yet to wear this out in public, but the idea is definitely growing on me. 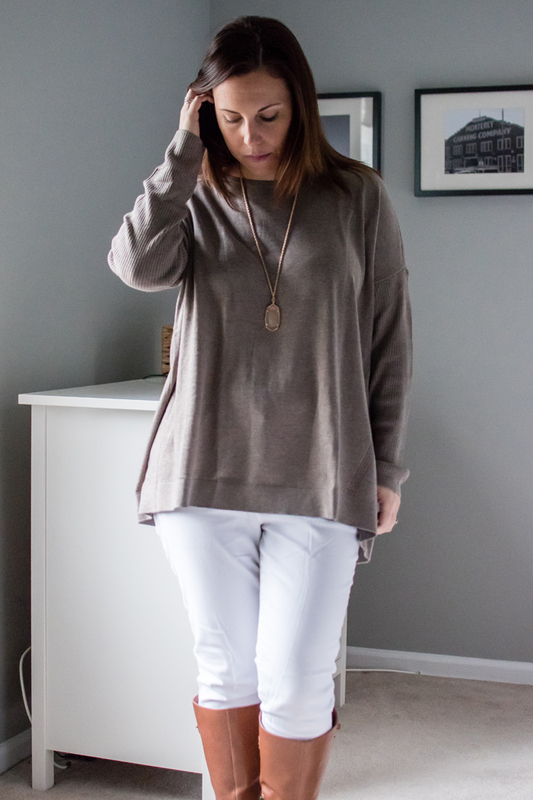 I decided to stick with neutral colors and made sure that my top and shoes were very winter appropriate to offset the more summery white jeans. I also like that the riding boots means that I don't have a full white leg showing. It minimizes the amount of stark white, which in turns makes me more comfortable with the outfit. And now that I've styled this "winter white" outfit, I'm tempted to try other options as well. I'd love your feedback and more outfit ideas if you have them! I'm excited to be linking up with Whitney today for the first "A Year of Color"! I love this look and that you are brave enough to wear white -- winter or not. I would be paranoid I'd get something on them. My OCD never lets up! I have white jeans that I almost never wear because it's too warm to wear them when they are in season! I guess I should try the winter white thing too. I love this outfit and think you should definitely go out in public wearing it! I wish I wasn't so clumsy so that I could own white clothing items. It's perfect! I love the white on you, and it's just right for winter! Thank you so much for linking up today! I love white pants, but I would be terrified to wear them. My little toddler tornado puts his messy hands on everything! I love that outfit on you! You're so brave to wear white jeans! I used to say, never with kids! But really, I think I would be the one to spill something on me, not Mason. lol. Love that sweater too! Where'd you get it? I love that you paired the different shades of brown with white denim...beautiful look! This is an adorable outfit! I've never been brave enough to wear white jeans, in any season! I'd be afraid I'd quickly look like a dirt tornado surrounded me! Ha :). Love this look. I actually have some white capris I could totally wear with tall boots. Thanks for making me think of that 😆. Love this look!! And I want that sweater! Love love love the white jeans on you. Such a perfect way to brighten up winter! Such a pretty outfit! I have a sweater that is the same color, so I may be duplicating it! I love those! I want white jeans so badly, but I know that with my four little monsters they would get ruined so quickly... ahh... the joys of momlife. 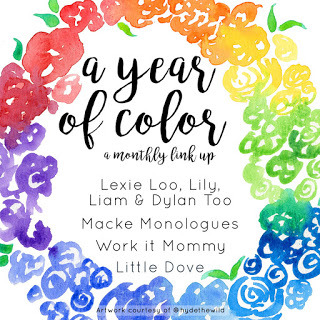 ;) Thank you for linking up with year of color! I hope you join us again!